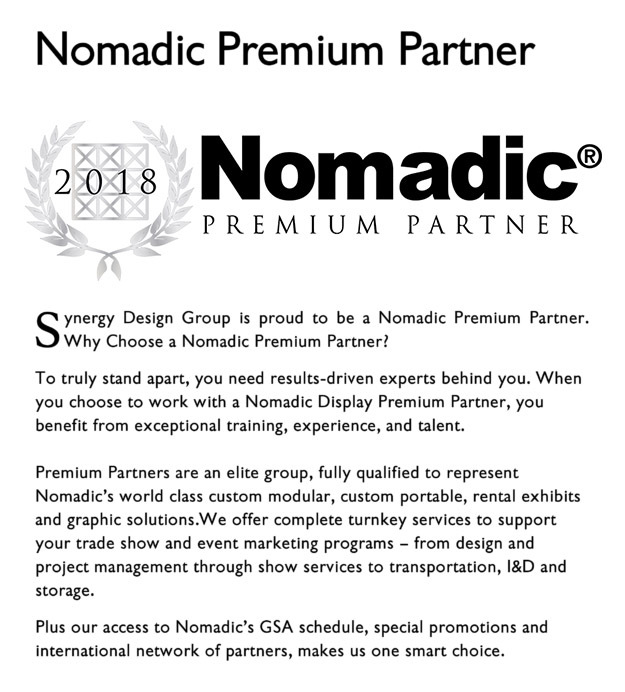 Synergy is proud to be a Nomadic Display Premium Partner since 2011 and a Nomadic Display distributor since 2000. What makes Synergy a Nomadic Display Premium Partner? Nomadic selects partners that have “exceptional training, experience, and talent” (Nomadic 2018). Partners are more than display houses, they deliver complete services from design and project management to labor services and storage. So what does Premium Partnership mean for customers? To become a Premium Partner, one must prove that one can create turnkey solutions AND deliver on promises. Nomadic recognizes that Synergy’s results-driven expertise helps clients increase sales, maximize their ROI, and get real results from the show so they can continue to improve their exhibiting strategy. Synergy wants clients to succeed in the long-term and is dedicated to creating displays that are as functional as they are beautiful. Connect today to work with Synergy for your next show!